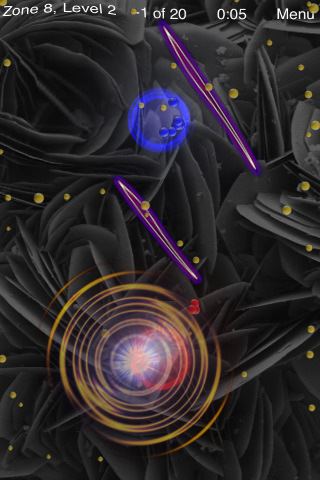 Subatomic is a funky space distortion resource management game that is available for the iPhone, iPod touch, and iPad. This app is created by 7b5 Labs and is available in the App store for $0.99 or you can get the Lite version (8/10/2010). I love this game because it’s so unique. The game works like this: You touch the screen and the area warps outwards, sorta like poking a balloon, where the area around your poking will inflate to accommodate the volume change. You use this system to push little floating blobs of color into a collection circle. You basically herd sheep playing off the little floaty-blobs’ physics-based speed. It’s crazy how easy it was to understand this after playing for about 20 seconds. The story is apparently, humanity has made a mess of things on Earth and now must fly off into space. Their rockets ferry humans to other planets and stars but the Reactor Cores must be charged with matter and antimatter in order to bring the people to safety. I have to say, this story is… kinda wasted. Honestly, I think I love this game simply because it sparks an artist draw for me. They have unique super-zoomed in bacteria as backgrounds for the levels, but that doesn’t match the space survival, earth destruction, rocketing to safety theme at all. Why not have a little rocket on a path on the bottom or top of the screen? Whenever you collect particles correctly, the rocket makes progress on the path. The level ends when the rocket hits the end and lands on a planet. It’s a simple way to keep to the narrative. Maybe instead of bacteria backgrounds, you could have scientists viewing through a window at the player watching the particles move. It would imply that there are people you want to protect in this core. You are essentially feeding the core two different elements and if you don’t do it correctly, a meltdown could occur. Show the rocket explode. It’s a tad morbid, but it tells a story. The game is great, works really well and I love the controls using distortion as your main guide for the little particles. I wish that the other, useless particles would be a different color however. With tons of random red dots floating around, it makes the red clusters harder to see. The blue ones stand out because, well, they are blue. Later levels become much harder and the challenge of balancing two reactors is really entertaining. It just feels like the story of the app was tacked on to justify what was happening in game. If you include a story, then run with it. Include small elements to make that theme count. Either that, or just forget about it and stick with “this is a game based around distorting space with your finger!” I’d still play that! But, besides that, this is a great game with really well done programming. Try it out with the Lite version, then if you like it like I do, buy it. AppSafari review of Subatomic was written by Joseph Ho on August 11th, 2010 and categorized under App Store, Fun, Games, iPad apps, Physics Based, Resource Management, Universal. Page viewed 3336 times, 1 so far today. Need help on using these apps? Please read the Help Page.